Question: I need a file-stamped copy of Submission ID: [xxxxxxx] and am having trouble online getting access. How do I get one? Answer: There are many ways to view and print your file stamped documents in FileTime. Listed below are a few of the ways to do so. This method is probably the quickest and it allows you to print the file stamped documents as you wish for submissions in a case. Find the case and click the + sign in the far left column so it becomes a - sign (Figure 1, C). 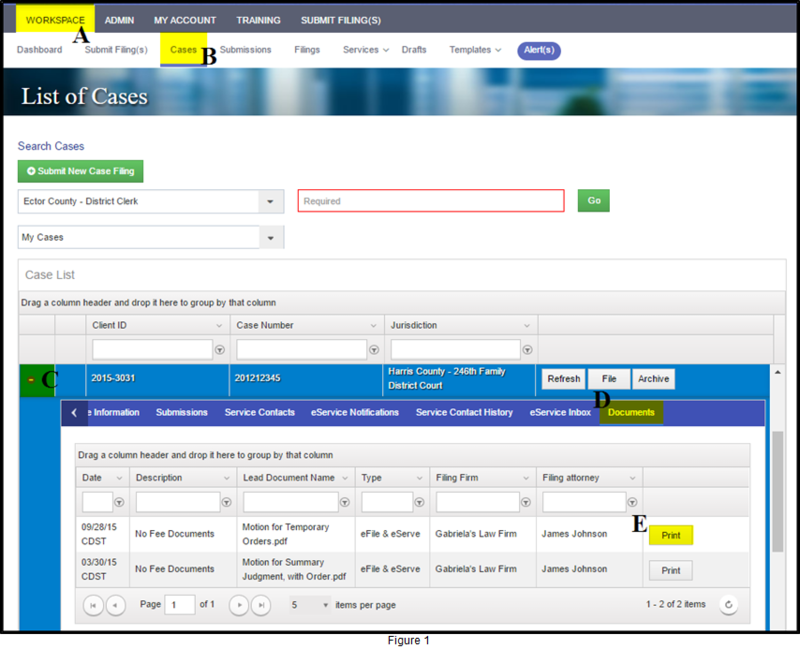 A list of tabs will appear below the case, click the Documents tab (Figure 1, D). You can then click the Print button (Figure 1, E) for any submission and print the file stamped document for any submission. 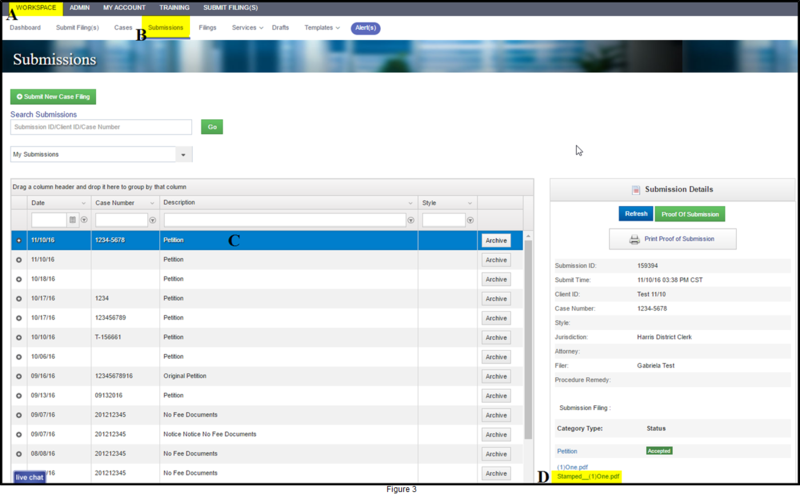 After logging into FileTime, click the Filings button (Figure 2, B) on the sub-navigation bar. Find the filing in question and click it to highlight it (Figure 2, C). 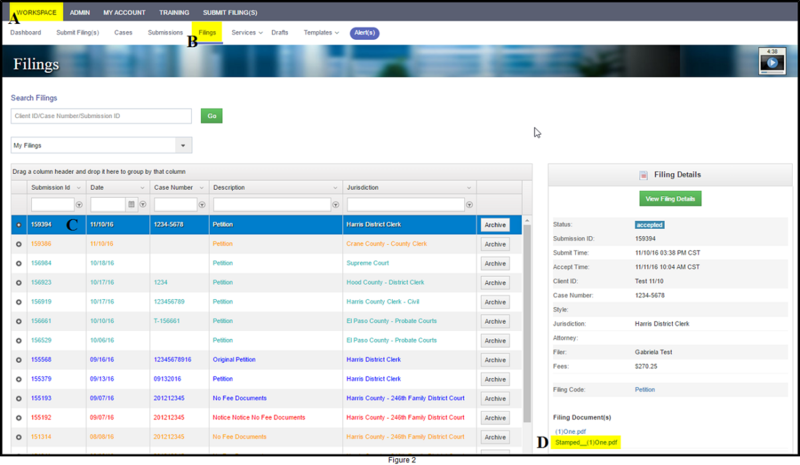 Scroll to the bottom of the Filing Details section for that filing and click the link to the file stamped document (Figure 2, D) to open and then print it. After logging into FileTime, click the Submissions button (Figure 3, B) on the sub-navigation bar. Find the submission in question and click it to highlight it (Figure 3, C). Scroll to the bottom of the Submission Details section for that filing and click the link to the file stamped document (Figure 3, D) to open and then print it.